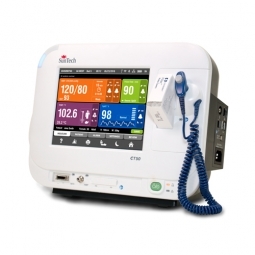 The LCD, color touch screen allows the user to stop/start a BP measurement, save a set of measurements to memory, control patient alarm functions, print measurements, and return to the home screen. 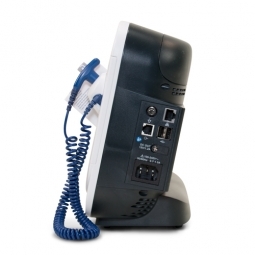 An optional barcode scanner or Wi-Fi dongle can be plugged into any of the four USB-A port connections. 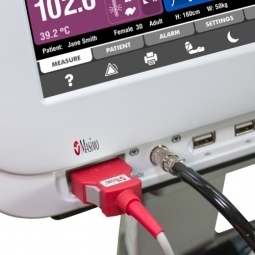 In addition to SunTech’s Advantage blood pressure technology, the CT50 can also be configured with Masimo SET® pulse oximetry and Covidien Filac 3000 temperature. *Not yet available in the US. The French version of the SunTech CT50 Brochure. The Italian version of the SunTech CT50 Brochure. The German version of the SunTech CT50 Brochure. The Spanish version of the SunTech CT50 Brochure. The Portuguese (Brazil) version of the SunTech CT50 Brochure. The A5 version of the SunTech CT50 Brochure. User manual for the SunTech CT50. 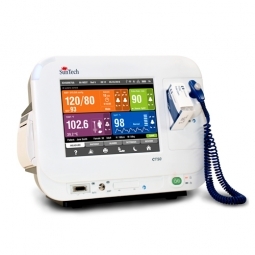 Learn how to take a blood pressure measurement using the SunTech CT50. 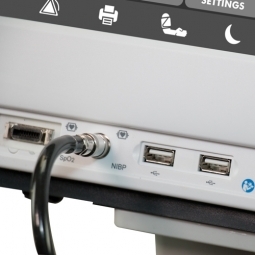 Learn how to save and review patient data using the SunTech CT50. Learn how to print patient data using the SunTech CT50. Learn how to access alarm history and set alarm parameters on the the SunTech CT50. Learn how to access advanced settings on the the SunTech CT50. What is the expected battery life for the SunTech CT50? Over 8 hours of continuous operating time. The device will automatically shut down when not connected to AC power supply and the battery charge is not strong enough to power the device. 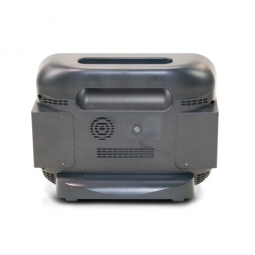 Can additional features (Temperature, Barcode Scanner, Printer, etc.) be added later? Only optional barcode scanners can be added later. How many measurements can be stored in the SunTech CT50 memory? More than 5000 measurements can be stored. Discover the Difference with the SunTech CT50 Today! 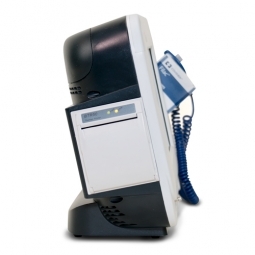 Request more information about the SunTech CT50 for use in your office.